Peggy Sue Gerron on the opening night of Buddy — The Buddy Holly Story, Feb. 3, 2009, in Sydney. 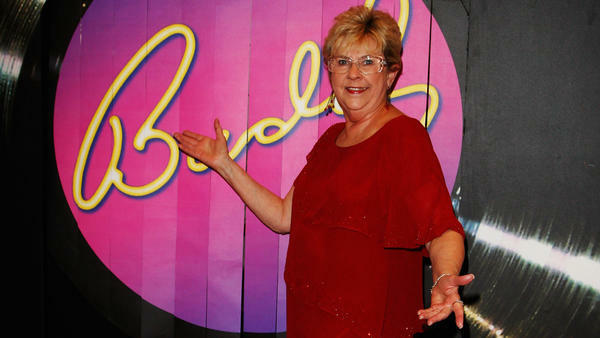 Gerron — the inspiration behind Buddy Holly's classic hit "Peggy Sue" — died Monday. "If you knew Peggy Sue / Then you'd know why I feel blue without Peggy / My Peggy Sue ..."
Peggy Sue Gerron, who died in Lubbock, Texas, on Monday at age 78, came to her fame honestly. A classmate of Holly's and his drummer, Jerry Allison, while at Lubbock High School, she began going out with Allison, often double-dating with Holly and his girlfriend. By the time Buddy Holly and The Crickets were in the recording studio, working on a rocker that Holly was planning to name after his niece, Allison suggested that a song about Gerron might further charm her. So after changing the subject and the song's beat from a cha-cha to a paradiddle, "Cindy Lou" became "Peggy Sue." But the life of Peggy Sue Gerron encompassed much more than being the inspiration behind and titular character of Holly's early hit. Gerron and Allison divorced in 1967 after eight years of marriage, and Gerron relocated to Southern California, where she remarried and raised a family, went to college and worked as a dental hygienist, eventually earning the distinction of being the first woman in California's history to become a licensed plumber. Gerron returned to Lubbock in 1995 to look after her mother and, by reconnecting with her roots, "was an instant celebrity, and recognized as such," Ayn Bowron, a mover and shaker on Lubbock's music scene who used to operate the fairly popular Mean Woman Grill, tells NPR. "She was the face of the resurgence of interest in Buddy Holly in Lubbock." That was a very big deal. Lubbock had a conflicted history, with a cultural heritage that became known to the world through the music of Holly and his Crickets. But rock and roll did not sit well with many of the city's leaders, who regarded themselves as God-fearing citizens who had no truck with the devil's music in the 1950s. The city's best and brightest musicians — Joe Ely, Jimmie Dale Gilmore, Bobby Keys, Natalie Maines — typically achieved fame after they left Lubbock. The Mac Davis lyric "Lubbock, Texas in my rearview mirror" says all you need to know. But Lubbock eventually came around to embracing its legacy, sometime after the release of the 1987 film The Buddy Holly Story, a subsequent traveling musical and the establishment of the Buddy Holly Center, which has become a touchstone for visiting fans. Garron embraced her unofficial ambassadorship to Lubbock, working with the city and the Buddy Holly Center to promote the music heritage of Buddy Holly and The Crickets, and West Texas writ large. A convivial people person, she enjoyed entertaining visitors and making public appearances on television (she was a guest on "I've Got A Secret" in 2001) and traveling to car shows and music events. She hosted a talk show, Rave On, on several Lubbock radio stations, with an international circle of phone pals who would sometimes call in weekly. "Peggy Sue was a 'connecting dot' to Buddy Holly and The Crickets," says Holly historian Randy Steele, who also grew up in Lubbock. "She was kind, warm and friendly and always ready with a story. She was a constant at concerts and various events, posing for photos, or signing autographs for music fans who came to the South Plains to celebrate the music and get a bit closer to the flame." "We often had dinner on the anniversary of the day the music died," Gerron's friend Shere Forkner tells NPR, referring to Feb. 3, 1959, when the plane carrying Holly, Ritchie Valens and The Big Bopper crashed in a nighttime snowstorm in northern Iowa, "and she would reminisce. One story she told many times was about the plans Buddy had to build a recording studio in Lubbock. He had asked Peggy to work with him on the project. We would speculate about how significant that studio would be to music, and to Lubbock." Gerron relished sharing stories about Holly and the years they all grew up in Lubbock. "She considered Buddy one of her very best friends in the whole world," Forkner says, explaining that Gerron had been missing her friend for almost 60 years. And now a lively, living connection to rock and roll's hometown roots is gone, too. "I think she was satisfied," Forkner said, "Although [city and civic leaders] never took full advantage of what she had to offer, in my opinion." "If you knew, Peggy Sue ..."